Shortly after birth the Princess Royal had been whisked upstairs to somewhat different surroundings – the attic story, far from frescoed staircases and damask chambers – to forge an intimate relationship with a mother of two named Mrs Muttlebury, who had been selected as her wet-nurse. But Mrs. Muttlebury remained somewhat bewildered by the honour done her. “She told Mama she had not the least notion of anything she was to do,” recorded Lady Charlotte’s daughter Sophia, “and begged her to tell her…” She was surprised to hear she must provide a maid – “I suppose from a notion of having people do everything for her,” commented Miss Sophia. “Mama told her of several other expenses, viz providing her own washing, always wearing silk gowns morning and evening…” The royal baby should come into contact only with superior materials – tussore and brocade and Mechlin lace for ruffles, as supplied by Lady Charlotte. It was a world unto itself, that of the Princess Royal and Mrs Muttlebury. The wet-nurse was allowed no visitors, not even her own children, to divert her from her duty. 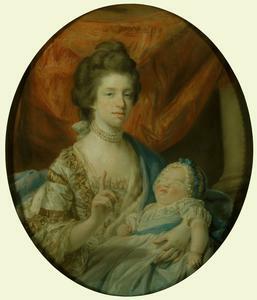 Mrs Muttlebury stopped breastfeeding her charge after six months, but continued working as a nanny for the royal family until 1770, for £200 a year. The Queen also paid school expenses for one of her sons. * she was the royal governess.